Orlando Local Guide is pleased to announce an all new website and travel guide to help visitors and residents celebrate and organize their Christmas celebrations in Orlando with the launch of OrlandoChristmas.com. Orlando Christmas Guide is the ultimate resource for all events and things to do around Orlando to celebrate Christmas. 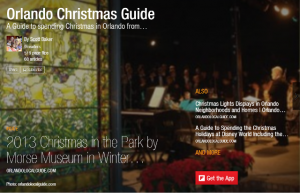 The official guide presents all of the best Christmas events in Orlando in a magazine-style format (see image above) that works great on any device (web, tablet, or phone). 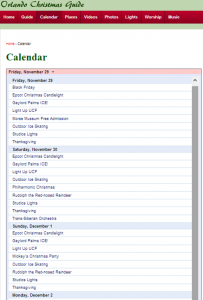 The calendar on Orlando Christmas Guide lets you know what is happening on the days of your visit with clickable links to articles that contain all of the information that you need to know about that event (see image at right). Select the events that you want to attend and automatically add them to your personal Google Calendar. Orlando Christmas Guide also has many articles, videos, and photos to view to help give you a complete picture of everything Orlando has to offer to celebrate the Christmas season. You will also find information regarding Christmas Eve Services and links to Christmas music. Click here to visit OrlandoChristmas.com and be sure to add the website to your Home Screen on your mobile device. This entry was posted in News and tagged christmas, travel guide. Bookmark the permalink.